Yemi Osinbajo has played an increasingly prominent role in Nigeria’s government since he was appointed President Muhammadu Buhari’s deputy in 2015. 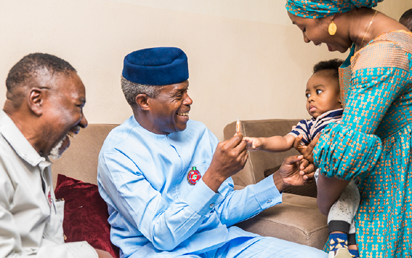 Vice President Yemi Osinbajo, SAN, continues “Family Chats’ in Zone 7 and Area 1, meets with Abdulwaheed Yusuf’s Family & Retired Col. Ahmed Zubair’s Family in Abuja.. 24th December, 2018. Nowhere has that been more clearly demonstrated than at a recent question-and-answer session during Buhari’s successful campaign for a second term, when the lawyer and church pastor spoke more than his boss. But he found a loyal ally in his vice-president. “He (Buhari) is not an orator,” Osinbajo stated afterwards. “My business is oratory. I’m a lawyer. Buhari has publicly shown his appreciation for his colleague, calling him his “running mate-turned-partner in service… and friend”. The pair are set to govern Nigeria for another four years after voters chose Buhari over his main challenger, former vice-president Atiku Abubakar in the February 23 election. To some extent, Buhari and Osinbajo are a political odd couple. In one campaign poster for the 2015 election, Buhari was dressed in a black dinner suit, white shirt and velvet bow tie and loomed uncomfortably over his diminutive running mate. Osinbajo had likewise abandoned his traditional flowing robes but looked more relaxed in a smart, Western business suit. For several months in 2017, it seemed as if the pair’s campaign slogan — “Change” — could well mean Osinbajo replacing Buhari as head of state. Buhari spent months undergoing medical treatment at a London hospital, stoking concerns his undisclosed condition was terminal. Osinbajo stepped up as acting president and was considered to have acquitted himself well. Beyond the obvious gulf in physical stature, there are striking differences between the pair. Buhari, a Hausa-speaking Fulani from Muslim-majority northern Nigeria, is a straight-backed, no-nonsense former army general who headed a military government in the 1980s. Osinbajo, from Nigeria’s Yoruba heartland in the southwest, is a partner in a law firm, pentecostal church pastor, and respected university lecturer. Buhari has been seen little outside his official Aso Rock residence in the capital, Abuja, barring brief appearances at rallies during the campaign. Osinbajo is a more visible presence and was regularly seen touring the country, meeting and talking to ordinary Nigerians. London School of Economics graduate Osinbajo has been closely involved with trying to boost Nigeria’s economy after it plunged into recession in 2016. Elsewhere, he has spearheaded attempts to try to make Nigeria more attractive to visitors, and crucially overseas investors, by relaxing visa entry rules. How far Osinbajo has been acting on his own initiative or implementing the wishes of Buhari and his inner circle is unclear. During another Buhari absence in August 2018, he sacked the head of the intelligence service after security personnel staged a brief “takeover” of parliament. Otherwise, he is largely a technocrat who cut his political teeth under former Lagos state governor Bola Tinubu, serving as his justice commissioner from 1999 to 2007. Osinbajo was key in drafting the APC manifesto that was successful in wresting power away from the Peoples Democratic Party (PDP) for the first time in 16 years. Now that Buhari has secured a second mandate, it is likely Osinbajo will play a bigger role, effectively becoming the public face and voice of the presidency. Osinbajo’s youth relative to Buhari’s means he is free from the baggage of Nigeria’s troubled past. He also has strong political stock — his wife, Oludolapo, and the mother of their three children, is a granddaughter of the independence movement leader Obafemi Awolowo.